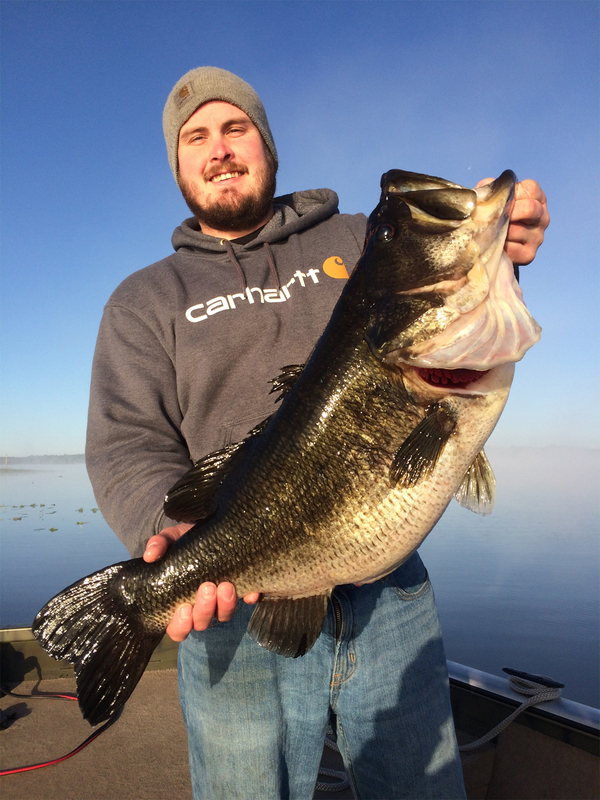 Dewight “Richie” Whitmore, 27, from Ringgold, Georgia, caught, documented and released a 14-pound, 1-ounce Florida largemouth bass at Rodman Reservoir on Martin Luther King Day. Whitmore, fishing with Georgia friend Josh Broome and Florida fishing guide Sean Rush, was using live shiners when they laid into the behemoth around 8:30 in the morning. Whitmore, who has been freshwater fishing all his life, joined Broome for a three-day guided trip during the long weekend. Fortunately for them, they hooked up with Rush, who is very familiar with the Florida Fish and Wildlife Conservation Commission’s (FWC) TrophyCatch program. “TrophyCatch is an incentive-based conservation program for anglers who catch, document and release largemouth bass heavier than eight pounds in Florida,” said KP Clements, the FWC’s TrophyCatch director. Data from the program helps the FWC enhance and sustain trophy bass fishing, and Rush has helped his customers document many such catches, including Season 1 champion Bob Williams from New Jersey. Consequently, when Whitmore landed this bass, Rush immediately called the FWC. Although not required to verify a Hall of Fame fish, FWC fisheries biologist Travis Tuten came off holiday leave with his kids to witness the catch, obtain additional measurements and take a fin clip for genetic analyses. They were also able to video the live release of the first Hall of Fame entry for Season 3 of TrophyCatch (visit http://www.Facebook.com/TrophyCatchFlorida to see the video). As a Hall of Fame entrant, Whitmore will receive a free replica of his bass, produced by New Wave Taxidermy, $200 in gift cards from TrophyCatch partners like Bass Pro Shops, a Fitzgerald rod and a sweatshirt-sunglasses combo from SpiderWire™. Right now, he also is in contention for the TrophyCatch championship ring that will be awarded by the American Outdoors Fund for the largest verified bass at the end of Season 3 (Oct. 1, 2014 to Sep. 30, 2015). During their three-day trip, Whitmore also caught and released four additional bass that are eligible for other TrophyCatch awards, and his buddy caught two more. “This lake is truly one of the best bass fishing and wildlife sanctuaries in the world,” said Rush, who is a fourth-generation Floridian. He loves showing his customers all of the eagles and other wildlife in this reservoir fishery. Whitmore couldn’t agree more, and immediately booked another trip. He said he’s coming back to Florida as often as possible to fish Rodman Reservoir. People can participate in this citizen-science effort and help encourage live release of trophy bass by registering at http://www.TrophyCatchFlorida.com. Simply registering makes people eligible for a Phoenix bass boat, powered by Mercury and equipped with a Power-Pole anchoring system and Navionics charting.